Broadly, the determinants of these changes include sociocultural and sociopolitical frameworks for understanding the condition, as well as advances in elucidation of its biomedical basis. It would be an educative exercise to further analyze these influences. From a biomedical viewpoint, the major influences have been two-fold: first is the unraveling of the medical basis of ID and its ever-expanding list of causes; second is the astonishing advances in understanding of the functionality of the brain and its growth, maturation, and development, down to the level of molecular genetics and molecular biology., These advances have radically and dramatically altered the way we look at ID now, compared to, say, five decades ago. ID is being more and more understood as an outcome of adverse influences on the developing brain, and hence as much a biomedical condition as a psychosocial construct based on intelligence and adaptive abilities. The developmental nature of ID also has been emphasized, either implicitly or more explicitly from earlier classifications. The sociocultural and sociopolitical influences have centered around the human rights of persons with ID, controversies around the nature and measurement of intelligence, and the need to consider the sociocultural milieu and the social expectations while making the diagnosis. For instance, the notion of “cultural-familial mental retardation” and “sub-cultural mental retardation,” which were quite popular in the 1960s and 1970s and based on assumptions about the distribution of intelligence, is no longer considered relevant. Another major sociocultural issue has been the inherent fallacies in the use of an intelligence quotient (IQ) test developed for one group of people for those from a different sociocultural background and the need for the development of standardized tests for the concerned population. Another welcome development has been the “person first” philosophy and avoiding the use of adjectival forms such as “mentally retarded” to refer to the individuals with ID. Over the last two decades, many constructs and principles have emerged and shaped the approach to ID in the current classificatory systems. First, there has been a search for better terminology and definition to eliminate pejorative terms and defining features, such as “mental retardation,” “arrested development,” and “mental deficiency.” More neutral terms defining the condition as a disorder with core impairment in intellectual ability have been considered. Similarly “person first” terminology has been adopted considering the human rights' perspective of individuals with ID. In classification, from a neurodevelopmental perspective, a major change has been grouping of ID along with other conditions under the overarching category of neurodevelopmental disorders that have onset in developmental period, affecting the functional abilities of brain, and having a continuous life course presentation. Another construct which has evolved in the last few decades has been better definition and characterisation of adaptive skills and giving significance to adaptive functions in diagnosis and classification of ID along with IQ scores. Similarly, by acknowledging the lifespan perspective of presentation of ID at different developmental stages, current classificatory systems have considered various behavioral and clinical indicators of intellectual and adaptive function skills that could be attained across these stages. This approach also helps in stressing the importance of early intervention. Reliance on these behavioral indicators to supplement or complement or as a substitute for diagnosing of ID rather than relying only on formal IQ scores is another significant trend. Keeping in line with the recent research that highlighted higher prevalence of other comorbid psychiatric and neurodevelopmental disorders, current classificatory systems have accepted the concept of dual diagnosis and behavioral equivalents to overcome diagnostic overshadowing in ID. There has been a welcome move in removing the multi-axial classification in the ICD-10 proposed by Rutter et al., in which different neurodevelopmental disorders would come on different axes such as autism spectrum disorder (ASD) in Axis I, specific learning disability in Axis II, and ID in Axis III., This was based on dubious and arbitrary grounds and tended to discriminate and stigmatize people with ID. In this section, we look at the salient features in ICD-11 regarding ID as per the beta draft and proposed Clinical Description and Diagnostic Guidelines. We also compare its salient features with the ICD-10 and elucidate the reasons behind the proposed changes. The ICD-11 has proposed to change the term “Mental Retardation” to “Disorders of Intellectual Development” (DID). The term “mental” is replaced by the term “intellectual” and “retardation” by the phrase “disorder of development.” The new ICD-11 term is similar to “Intellectual Developmental Disorder” (IDD) used by DSM-5. DID clearly indicates intellectual development as core impairment with neutral connotation. This change was necessitated by pejorative, negative, and pessimistic connotations of the terms mental retardation, arrested mind development, idiocy, imbecility, and mental deficiency mentioned in the ICD-10. The use of the term intellectual is also in line with the current definition of the construct of intelligence encompassing a wide range of cognitive abilities, adaptive function, and new learning ability, and has wider acceptance generally with professionals, lay individuals, and most of the health policy matters worldwide. The first suggestion to change the name came from an expert committee constituted by the WHO which published the report of its proceedings in 2011. This group suggested the name of IDD which is now changed to DID. However, both the term cover the same ground and appear semantically equivalent. The ICD-11 conceptualizes ID as a health condition or a disorder rather than merely a disability. This gives a balanced perspective by conceptualizing ID as a disorder in ICD and as a condition leading to disability that can be evaluated under the International Classification of Functioning Disability and Health (ICF). ID has been placed under the broader domain or parent category of “Neurodevelopmental Disorders,” acknowledging the diverse etiological factors originating during the developmental period. The construct of neurodevelopmental disorders has been widely accepted as an umbrella term that includes a group of conditions such as DID, ASDs, developmental speech and language disorders, attention-deficit hyperactivity disorder (ADHD), and specific learning disorders, affecting early developmental process in corresponding domains., This gives a clear perspective on the presentation, course, and causative factors of these related conditions and has found acceptance in both ICD-11 and DSM-5 classifications. Intellectual functioning is defined in abilities across various domains such as perceptual reasoning, working memory, processing speed, and verbal comprehension. This is derived from large-scale factor analysis of the Wechsler Intelligence Scale for Children-IV., DSM-5 defines intellectual functions more elaborately as reasoning, problem-solving, planning, abstract thinking, judgment, academic learning, and learning from instruction and experience, and practical understanding confirmed by both clinical assessment and standardized tests. Overall, the current definition and conceptualization of intellectual function and adaptive function in ICD-11 is a welcome change as it has replaced the concept of arrested or incomplete development of mind as a defining feature in the ICD-10. The current concept of cognitive development, cognitive abilities, and intelligence is much more dynamic and malleable than before, based on research advances in the role of experience-dependent learning and neural plasticity, and this has been taken into consideration in the definition. Interestingly, both ICD-11 and DSM-5 have not specified an upper age limit for the developmental period unlike earlier versions. Though this conceptually makes some sense, it might cause hurdles from an administrative point of view. For instance, consider the vexatious issue of whether someone who develops cognitive impairment following trauma or infection at the age of 19 years will get social security benefits of ID or not. From the beta draft definition, it is clear that ICD-11 gives much significance to appropriately normed, standardized tests for intellectual function, and adaptive behavioral assessment. Clinical assessment of behavioral indicators can be given greater reliance on diagnosis only when standardized tests are not available. Overall, ICD-11 provides better definition and description of intellectual function and adaptive behaviors, and also description of different severities of ID than ICD-10. DSM-5 definition of ID is based on intellectual and adaptive functioning deficit as per both clinical assessment and standardized testing. This may not be a practical approach in most of the low- and middle-income countries (LAMICs), where standardized tests are not readily available in the community or even if available may not be applicable to the full range of individuals as it is common to see ID presenting to health professionals for the first time across all age groups. Since the ICD-11 is still in the beta draft phase, it is worthwhile to consider putting clinical assessment on equal footing with standardized tests of intelligence for the definition. The ICD-11 could consider giving equal importance to the standardized assessment of intellectual and adaptive function along with a clinical assessment of behavioral indicators in respective domains. The ICD-11 retains the earlier subtypes of mild, moderate, severe, and profound DID and has added a new subtype: provisional subtype. 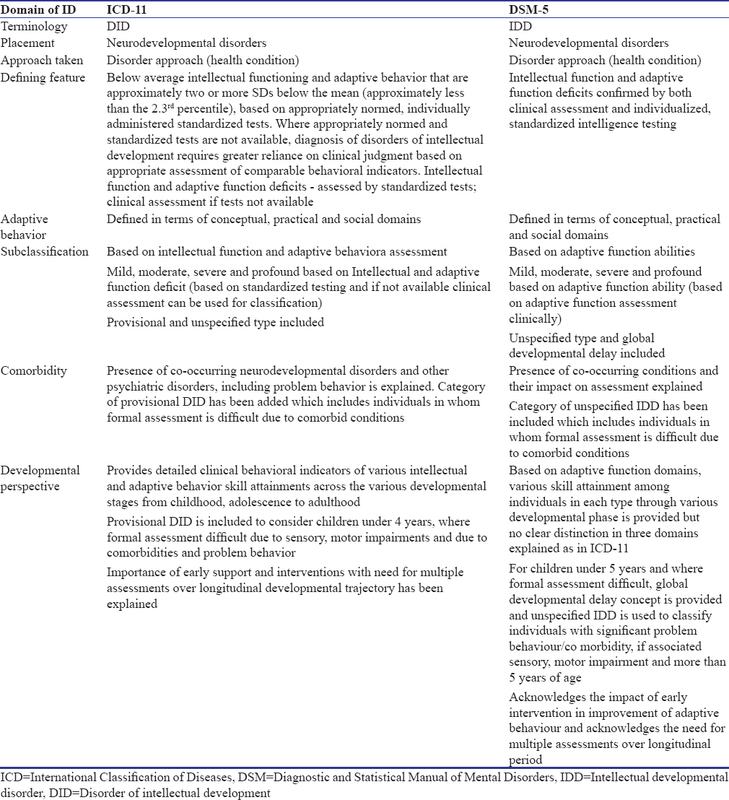 The classification into mild, moderate, severe, and profound ID is based on the severity of impairments in intellectual functioning and adaptive behavior as measured by standardized tests or based on appropriate clinical indicators if tests are not available., [Table 1] summarizes the ICD-11 approach to classification of DID. The DSM-5 also includes the categories of mild, moderate, severe, and profound IDD, but this is based on adaptive skill attainment alone as determined by standardized testing and clinical assessment. Categories of global developmental delay (GDD) and unspecified IDD are also included. Borderline intellectual functioning finds mention in the ICD-11 diagnostic guidelines draft in individuals who fall 1–2 SD below the mean in standardized tests of assessment of intellectual and adaptive behavior, not as a diagnosable disorder but as a condition requiring early intervention. Borderline intellectual functioning has been mentioned in the DSM-5 in the section “Other Conditions that may be a Focus of Clinical Attention,” under “Other Circumstances of Personal History.” DSM-5 having moved away from defining IQ score range for different subtypes of IDD, does not specify any specific indicators for defining borderline intellectual functioning. The DSM-5 states that the V-code (V62.89) can be used when an individual's borderline intellectual functioning is the focus of clinical attention or has an impact on their treatment or prognosis. Differentiating borderline intellectual functioning from mild ID requires careful assessment of intellectual and adaptive functions and their discrepancies, particularly in the presence of co-occurring mental disorders that may affect standardized testing procedures. The ICD-11 acknowledges the importance of both intellectual functioning and adaptive skills in specifying the degree of the DID, by providing a comprehensive account of behavioral indicators that are characteristic of individuals in each subtype. These descriptions cover a wide range of abilities and are more comprehensive than the descriptions provided in the ICD-10. Confounding factors such as properties of the test used, testing conditions, low literacy levels, sensory impairments such as blindness and hearing impairment, comorbid psychiatric disorders, severity of problem behaviors, psychosocial deprivation, and cultural factors and their impact on test items should all be considered in interpreting an IQ score. Thus, ICD-11 gives more emphasis on clinical behavior indicators when standardized tests of intellectual function and adaptive functioning can't be administered. Also, ICD-11 diagnostic guidelines give a detailed account of behavioral indicators pertaining to intellectual function and adaptive behavior across different age groups that can be attained by individuals with varying degrees of ID. DSM-5 has taken a different approach in classification, basing it on adaptive function domains alone, on the grounds that adaptive functioning determines the level of support and that IQ measures are not valid in lower ranges. This approach has interesting implications: DSM-5 looks more practical for clinical practice whereas ICD-11 could serve the research and administrative purpose better. ICD-11 and DSM-5 both acknowledge the importance of early and appropriate intervention in improving the impairments and suggest longitudinal assessments over the developmental trajectory in an individual emphasizing the dynamic nature of the condition. ICD-11 includes a separate category of provisional DID when there is evidence of a DID but the individual is an infant or child under the age of four or it is not possible to conduct a valid assessment of intellectual functioning and adaptive behaviour because of sensory or physical impairments (e.g., blindness, prelingual deafness), locomotor disability, severe problem behaviours or co-occurring mental and behavioural disorders. DSM-5 includes the nomenclature of GDD for children below age 5 years, who are too young to participate in standard developmental assessment but show evidence of delay in attainment of developmental milestones. ICD-11 category of provisional DID appears to be a mixed bag that includes young children under 4 years and other individuals who could be older with comorbid factors that may impact valid assessment. This brings in certain amount of ambiguity. From a clinical point of view it would be better to retain this category only for young children and put all the rest in unspecified category. ICD-11 allows for comorbid diagnosis of DID and other neurodevelopmental disorders if the core impairment in the other disorder is significantly lower than what would be expected based on intellectual and adaptive behaviour functioning. If all requirements for a DID are met and inattention and/or hyperactivity-impulsivity are found to be outside normal expected limits based on age and level of intellectual functioning with significant interference in functioning, both diagnoses of ADHD and DID can be made. In diagnosing comorbid ASD, adaptive function assessment has to emphasise conceptual and practical domains considering the inherent deficit in social skills in persons with DID. Diagnosis of developmental speech and language disorder can also be made if language abilities are significantly below the current level of intellectual and adaptive behaviour functioning. Prevalence of other comorbid mental and behavioural disorders in individuals with DID has been acknowledged and need for considering the individual's level of development and intellectual functioning in assessing the symptoms with greater reliance on observable signs and the reports of caregivers in assessment is emphasized. This has been a welcome change in ICD-11 compared to ICD-10 and also DSM-5 which does not mention comorbid conditions in detail. Both classifications mention the impact of comorbid condition in assessing intellectual ability by standardized testing. There are many similarities as well as differences in the approach to classification of ID between these 2 systems. These are laid out in [Table 2]. The principles of classification mentioned above have by and large been followed by both systems. From [Table 2] and the discussion above it is clear that ICD-11 continues to give prominent place for standardised tests for assessment of intellectual function. Significance of clinical assessment of behavioural indicators has been emphasised only when standardized assessments cannot be carried out. However DSM-5 seems to have taken the view of giving equal importance to standardized assessment and clinical assessment. In classifying the subtypes also DSM-5 has taken an approach of using behavioural indicators of adaptive function as the criteria. However ICD-11 has compensated by giving a more comprehensive and better account of clinical behavioural indicators for intellectual and adaptive function across different age groups like early childhood (0–6 years), childhood and adolescence (6–18 years) and adulthood (18 years and above) for each subtype of DID. Significance of comorbid neurodevelopmental and other psychiatric disorders, allowing for dual diagnosis and acknowledging the behavioural equivalents in diagnosis has been given importance. Even though ICD-11 has acknowledged the importance of assessing the comorbid psychiatric disorders by behaviour observation and caregiver information, a better account of presentation of other psychiatric comorbidities in the presence of DID could be mentioned under the respective individual disorders. Overall, ICD-11 has taken into consideration the various influences on brain development and their reflection in defining intellectual function and adaptive behavior. The diagnosis is based on clinical behavioral indicators of skill attainment over different stages of developmental trajectory. Moving from IQ scores alone as a major criterion for diagnosis, considering the sociocultural factors and relying on adaptive skill attainment in practical, conceptual and social domains gives it better clinical utility. To conclude, ICD-11 has provided a more humanistic, developmentally informed and comprehensive biopsychosocial viewpoint for DID. Schalock RL, Luckasson RA, Shogren KA, Borthwick-Duffy S, Bradley V, Buntinx WH, et al. The renaming of mental retardation: Understanding the change to the term intellectual disability. Intellect Dev Disabil 2007;45:116-24. Salvador-Carulla L, Reed GM, Vaez-Azizi LM, Cooper SA, Martinez-Leal R, Bertelli M, et al. Intellectual developmental disorders: Towards a new name, definition and framework for “mental retardation/intellectual disability” in ICD-11. World Psychiatry 2011;10:175-80. Chelly J, Khelfaoui M, Francis F, Chérif B, Bienvenu T. Genetics and pathophysiology of mental retardation. Eur J Hum Genet 2006;14:701-13. Vissers LE, Gilissen C, Veltman JA. Genetic studies in intellectual disability and related disorders. Nat Rev Genet 2016;17:9-18. Hodapp RM, Burack JA, Zigler E. Issues in the Developmental Approach to Mental Retardation. New york, Cambridge: Cambridge University Press; 1995. p. 352. Schalock RL, Brown I, Brown R, Cummins RA, Felce D, Matikka L, et al. Conceptualization, measurement, and application of quality of life for persons with intellectual disabilities: Report of an international panel of experts. Ment Retard 2002;40:457-70. Rutter M, Shaffer DR, Shepherd M. A Multi-axial Classification of Child Psychiatric Disorders: An Evaluation of a Proposal. Geneva: World Health Organization; 1975. World Health Organization. Multiaxial Classification of Child and Adolescent Psychiatric Disorders – Cambridge University Press. Available from: http://www.cambridge.org/catalogue/catalogue.asp?isbn=0521065771. [Last cited on 2017 Jun 16]. ICD-11 Beta Draft. Available from: http://www.apps.who.int/classifications/icd11/. [Last cited on 2017 Sep 06]. Bertelli MO, Salvador-Carulla L, Scuticchio D, Varrucciu N, Martinez-Leal R, Cooper SA, et al. Moving beyond intelligence in the revision of ICD-10: Specific cognitive functions in intellectual developmental disorders. World Psychiatry 2014;13:93-4.
WHO | International Classification of Functioning, Disability and Health (ICF). WHO. Available from: http://www.who.int/classifications/icf/en/. [Last cited on 2017 Jun 16]. World Health Organization. Draft ICD 11 Diagnostic Guidelines Neurodevelopmental disorders; 2017. Diagnostic and Statistical Manual of Mental Disorders | DSM Library. Available from: http://www.dsm.psychiatryonline.org/doi/book/10.1176/appi.books. 9780890425596. [Last cited on 2017 Sep 06]. Benson N, Hulac DM, Bernstein JD. An independent confirmatory factor analysis of the Wechsler intelligence scale for children-fourth edition (WISC-IV) integrated: What do the process approach subtests measure? Psychol Assess 2013;25:692-705. Wechsler D, Antonio S. Wechsler Intelligence Scale for Children. 4th ed. (WISC-IV). TX: The Psychological Corporation; 2003. World Health Organization. The ICD-10 Classification of Mental and Behavioural Disorders: Clinical Descriptions and Diagnostic Guidelines. Geneva: World Health Organization; 1992. p. 377. Kleim JA, Jones TA. Principles of experience-dependent neural plasticity: Implications for rehabilitation after brain damage. J Speech Lang Hear Res 2008;51:S225-39.